One of the accessories that eluded me the most when I was looking for details for my wedding, was the perfect pair of bridal earrings. So that you won’t run into the same trouble, I’ve picked 8 beautifully bold statement earrings that will be a stunning accent to any bride’s look. Shopping sources on this site use affiliate links, which means this site may earn a commission if you make a purchase after clicking our links. Your clicks and purchases help support this site! 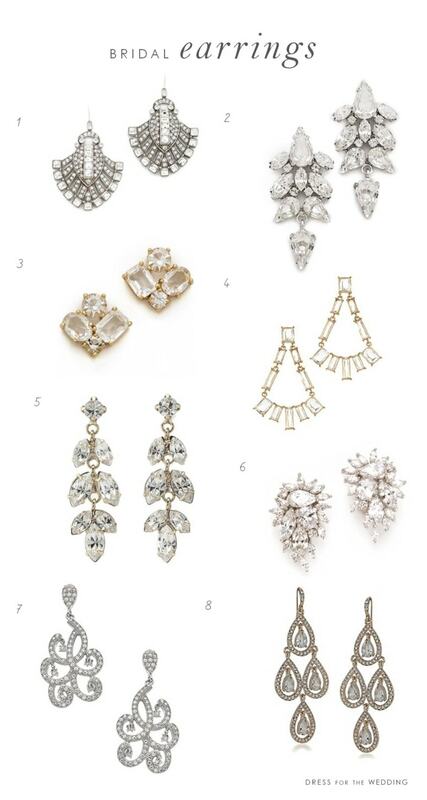 If you’re still on the search for wedding earrings, here is a selection for you to shop from! 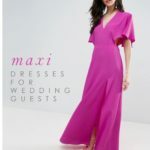 Now, I hope you found a pair you like in the shopping section, but in case you didn’t, here’s more on my search for wedding earrings if you are curious! So, yep, with all the things one has to find for a wedding, earrings for my wedding was one of the hardest searches I had. I found the dress after 3 tries, but the earrings were much harder. There were a few family pieces that I could have worn, but because my dress was a simple strapless dress, and I was wearing my hair down, I wanted either a statement necklace or big earrings to stand out against my hair, and to accent that type of wide open neckline. I don’t know if it was just that the style I was after wasn’t in that year, or that I wasn’t searching the right way, but everything I seemed to find were subtly sized pearl or diamond drops, or overly big and gaudy huge chandelier earrings with what I can only describe as having weird shapes that looked like those scale symbols you see to signify a pawn shop. I ended up buying about 7 pairs of earrings. Some were too ornate and involved, while others were just too tiny when I saw them in person. I finally found a pair that I liked, that were very similar to style #8 up there. I’d probably now go with something like #5, or #1, or #6 ( ok, or maybe all of them!) but I couldn’t find anything like most of these earrings at the time. Once I got a veil, and tried putting the whole look together, I decided my chosen chandelier earrings were too big — so I planned to wear a more demure pair for walking down the aisle. While they were pretty up-close, in the photos they looked barely-there and way too subtle. I also didn’t love how I looked in my veil, but I felt like I had to wear one of the classic style veils to look officially “bridal” . Now, I would definitely listen to my instincts and pick a headpiece in a scale that was more me. 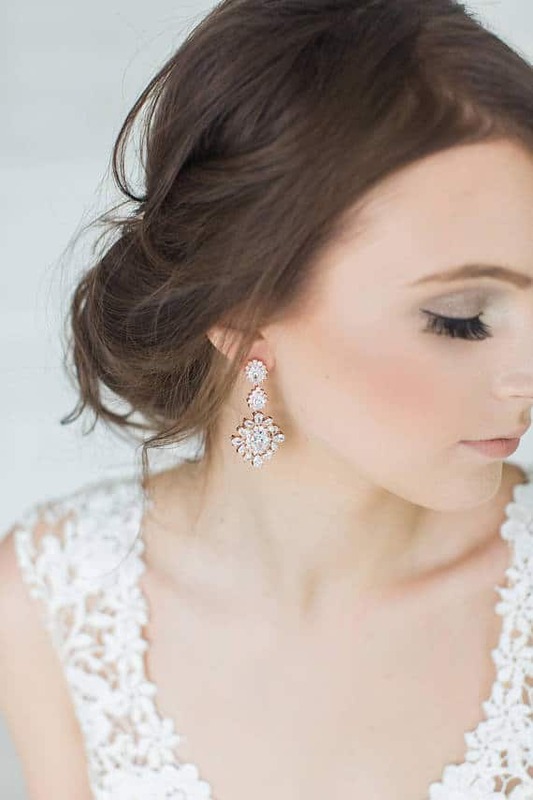 How A Change of Wedding Earrings Can Be a Quick Way to Change Your Look! You’ve heard how some brides change into a different dress for dancing ? Well, mid-reception, I took off my veil, and changed into bigger accessories: a crystal bracelet and crystal chandelier earrings. I felt so much more like “me” when I changed, I liked how in those photos, and generally looked like the bride I wanted to be. It seems a little silly to have a life lesson about something like bridal earrings, but if you tend to wear very simple and small pieces like I do, and know you want to kick it up a notch with some statement jewelry for your wedding day, my advice to go with something a little bigger and more eye catching than you’d think – especially if your dress is simple. here are certainly dresses and pairings of accessories where simple pearls and or diamond studs would be the best choice ( for instance, if you have a standout neckline, or a dress with some big detail, or you want a very simple look) but just like I needed to wear a little more lipstick and have my hair more done than usual, it turned out wearing a pair of truly special bridal earrings was what I needed for a little more oomph to my bridal style. 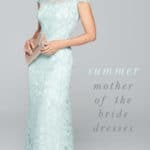 Nordstrom – Top names like Nadri, kate spade new york, Kendra Scott , great styles for the entire wedding party. Shop earrings at Nordstrom. Affiliate links are used in product listings, meaning this site may receive a commission for purchases or clicks made through links in this post. All are stunning but I am beyond obsessed with the crystal chandelier earrings by Carolee Pave! I’m over the moon for #3 and #5! I totally agree about going bigger than you think for your bridal jewelry! I thought I had gone overly large for my earrings but ended up being glad as at least you can see them in the photos. Dying over pair #1!